As promised, this evening we made the draw to see who would win a signed copy of The Crime Writer and Other Stories. All the names went into one of my son’s caps and he drew one out. Fair and square. Before I reveal the name of the ‘lucky’ winner I’d like to say again how honestly appreciative I am of all those who not only downloaded and read the book, but also went that extra mile and posted a review on one of the Amazon sites. I truly wish I could afford to send everyone a copy of the book for their support. Thank you. I honestly believe that the number and average rating of reviews the book received will encourage Amazon to take a look at it when they’re considering things but a cursory glance is probably all it will get. Over 2600 books were entered in the Kindle Storyteller competition (that’s a lot of books) and a lot of them will be a lot better than mine. Also, being realistic, short story compilations are never going be a match for a well-crafted full-length novel in a writing competition. There just isn’t the interest in short stories – I’ve heard that a lot lately. Shame. I love shorts and I think they have a lot to offer readers. The last chance and the last dance. Tomorrow is the closing day of the Amazon Storyteller competition that I entered my book The Crime Writer and Other Stories into. Amazon will be looking at the usual suspects when judging the entries: sales, quality of the writing, sales, potential for more sales, popularity, sales, feedback, sales, that kind of thing. If anyone reading this has downloaded the book (thank you) read it (thank you) and hasn’t left an honest review yet and feels like doing so, tomorrow is the last chance. Once again, sincere thanks to all those who have supported me in this. I really appreciate it. Everyone who leaves feedback on any Amazon site will be put into the draw to Win a signed copy! I said I’d make that draw on the weekend but I forgot I’m away. We’ll make the draw on Monday and I’ll post news of the ‘lucky’ winner. I should point out that I’m not back in the UK until 11th June. That week is the earliest I can sign and send the book. I want to mention Bloodhound Books. 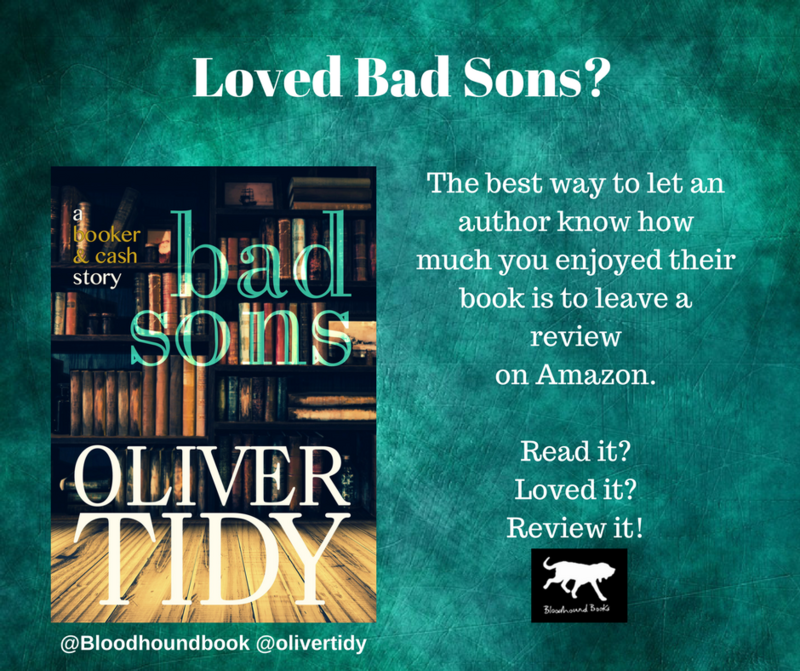 Bad Sons was re-published by them last week and all this week Bloodhound have been pushing the book on all the usual social media outlets. They’ve done a lot of work. I appreciate it. And so to the last dance. This weekend is my last chance of a last dance with Istanbul. As mentioned above I’m back in th UK on the 11th June. Permanently. It’s only just over three weeks away. While I’m looking forward to that it’s going to be the end of an era. My fondest memories of my time in Turkey are from Istanbul. I’m heading back there for a long weekend to revisit some good memories and some old haunts and to say goodbye to somewhere it’s unlikely I’ll visit again. Today is the day that Bad Sons (Booker & Cash #1) is officially re-released by Bloodhound Books. They’ve given it a new cover which is great. What’s also great is that the book is available in paperback for the very first time. Bloodhound have organised a blog tour for the book’s re-release. Never had something like that before. Just a week to go before the Amazon Storyteller competion closes. Sincere thanks to all who have supported me in this. I’m always really touched that I have so many supportive readers. If anyone is interested in going into the draw for a signed copy of the book I entered please see here. Win a signed copy! Lots of images this week. Last but not least the line up for the evening I’m attending with the other hounds from Bloodhound Books. It’s a ticketed event but they are free and need to be booked online. More info on tickets at the Bloodhound Books website. Win a signed copy of my latest book! As I’ve mentioned before, getting some feedback up on Amazon is going to be an important factor for those judging the competition. I’ve had some comments posted by readers and so far they are very encouraging. Before I say anything else I would like to thank each and every one of you sincerely for your time and trouble to post feedback. Your ongoing support is much valued and appreciated. To be eligible for entry into the competition entrants must have both ebooks and physical books available to purchase. Because of that condition I organised the availablity of paperback copies of the book. And, of course, seeing as I’d gone to all that trouble I caved in and ordered a couple for myself and posterity. Like you do. They’ve arrived and they look good. They smell nice, too. Seeing the physical books gave me an idea. To encourage readers who might not ordinarily be inclined to leave feedback on Amazon I thought I could provide an incentive. I thought I could use one of the paperback copies to that end. So here’s what I’ve come up with. The Amazon competition closes on May 19th. On May 20th I’ll put all the names of readers who have left a comment on either Amazon UK or Amazon US into a ‘hat’ and get my five year old son to pick out one of them. That ‘lucky’ reader will receive a signed copy of The Crime Writer and Other Stories. I’ll even pay for the postage. If I get a combined total of more than fifty comments on both Amazons I’ll give away two signed copies. If I get a hundred I’ll walk the length of Dymchurch high street wearing nothing but my boxers while reading from the book (anything Lineker can do) and then give away three signed copies. A short post to say thank you very much to everyone who has supported me through downloads and post shares relating to my latest book. Last night I went to bed a nobody. This morning I’m an Amazon Bestseller. It’s all in a good cause. Please see here for more information on that Amazon Storyteller. And there is still time to grab a copy, read and honestly review it before the Amazon Storyteller competition ends on the 19th May.